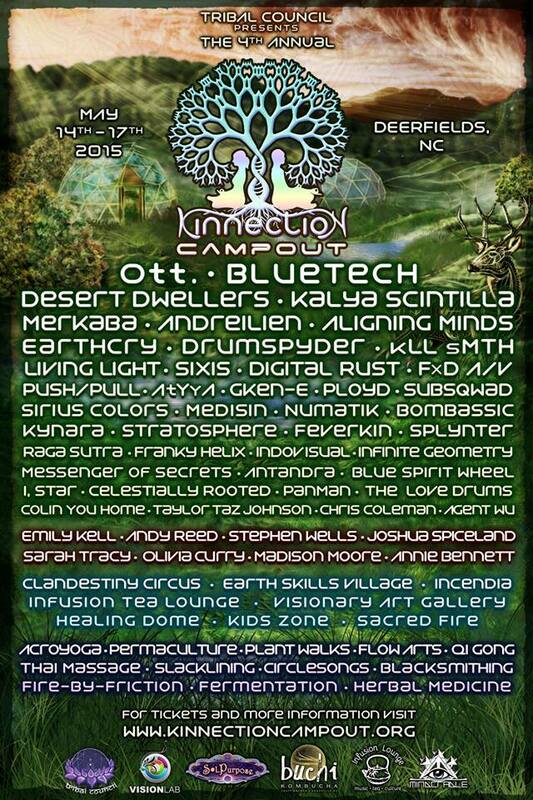 Kinnection Campout 2015 has found its new home at the legendary Deerfields, located just outside of Asheville, NC in the beautiful rolling hills of southern Appalachia! While Deerfields has been hosting small music festivals and regional burns for decades, it has not hosted an event of our kind since STS9’s Re:Generation Festival and Trinumeral 9.9.9. We are honored to be welcomed onto this amazing land and we look forward to showing Deerfields what a safe, respectful, & all-around wonderful vibe our community brings. Complete with two pristine swimming lakes and surrounded by 1000’s of acres of Pisgah National Forest, it has been our dream to host a gathering at this special site since we stepped foot on it ten years ago. Those of you who have experienced its magic know it already; and for those who have yet to, we are so excited to share it with you! Save the date (May 14-17, 2015) and make sure you stay tuned to the channels for announcements, invitations, & opportunities. Our mailing list subscribers will get first dibs on a limited round of pre-sale tickets. See below for channels to follow. And a sneak peek into the TC labs to show what we’re brewing up for you all this year: a primitive skills village, a squishy acoustic chill-out temple space, diverse musical lineup spanning everything from rootsy organic instrumental music to world-infused bass, and adjusted hours that will balance bright days full of focused connection & activities with nights full of dancing. We believe in the power of integrating the wisdom of traditional tribal culture with the emerging modern visionary culture. The Campout is our humble attempt at integrating the power of praying, dancing, and learning into a holistic experience that offers a tangible glimpse into a new way of relating to each other, to ourselves, and to the entire breathing world of which we are part. We look forward to kinnecting with you and the gifts you bring, as we get in touch with our roots and explore together what it means to be a tribe in 2015, complete with music & dance, earth skills village, permaculture classes, and medicine songs around the sacred fire. « . ::Welcome to Pangea pt. 8 – Into the Infinite::.